As of November 16, 2014, Mover no longer supports Bitcasa due to changes to their service and API. Read on for the original article. Late last week we soft launched our Bitcasa integration. Bitcasa has long been one of the most robust cloud storage providers in the marketplace. Launched in 2011, Bitcasa offers unlimited storage for its users and is one of the largest providers of cloud storage data in the world. Today we are proud to announce that Bitcasa and Mover have partnered to enable an easy way to migrate data in and out of Bitcasa! Bitcasa bills themselves as “Your Digital Home, Accessible Everywhere.” and they aren’t lying! Bitcasa offers a great storage plans which are competitive with other providers, and they have great mobile apps for every major platform, even the new Firefox OS. Bitcasa uses client-enabled AES-256 block-level encryption for all data uploaded. More importantly and a key differentiator is that each end user has a unique personal key owned by them, not Bitcasa. This means all server-side data is stored with zero-knowledge to Bitcasa, or would-be hackers. No one but the original owner, not even Bitcasa employees, can ever view files uploaded to Bitcasa. Lastly, Bitcasa has expanded their product into a platform, with the Bitcasa CloudFS Platform offering any developer in the world can create a turnkey cloud storage service of their own, or utilize infrastructure to enhance their own storage requirements. Definitely check it out if you are a developer. 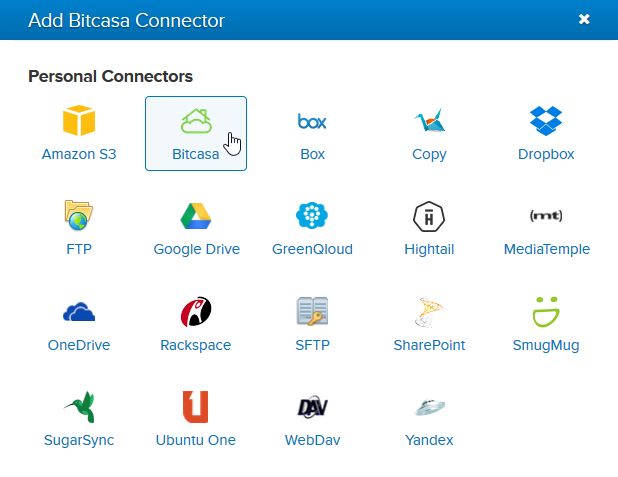 Getting started with our Bitcasa connector is very easy, you can add it like any other connector in Mover! For more detailed instructions visit our support pages. If you liked this post then don’t forget to check us out on Facebook, LinkedIn and Twitter.